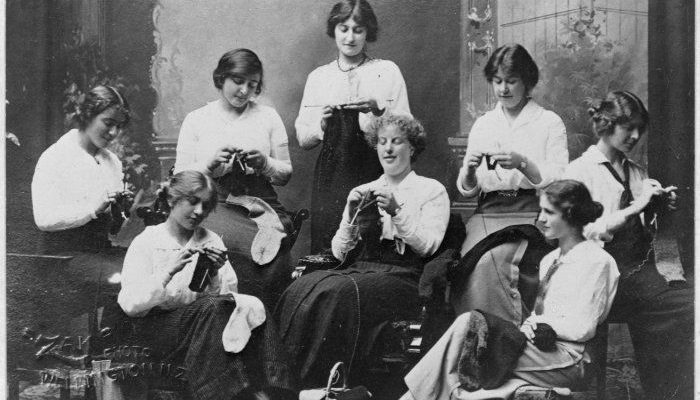 The history of knitting is an interesting topic to think about. Knitting, as we all know, it is the process of creating loops of threads that lock on each other row by row with the use of needles and yarn. The word “knit“ originates from the word “cnyttan” which means to tie with a not. We still don’t know the exact date of “first knitting project” the mankind has ever created till this day, however, we know that knitting is said to date in the Middle East, Mesopotamia, like the spinning and weaving, and we hear some speculations about the Egyptians invented knitting. Some fragments of knitted fabric were discovered in Eastern Syria by an independent researcher named Rudolf Pfister, which date to 250 A.D. Those early prototype of socks were using the technic called nailbinding, which is a knotless fabric creation technic that predates knitting. Nailbinding was time-consuming, so mankind had to invent a better way to create fabric. This was the time when the knitting came along. Historians believe that the trading routes of ancient times helped knitting and nailbinding spread across the world, evolved and became the modern day craft that we all love. And even in the darkest times of humanity, we have never stopped knitting to this day. Wartime has involved knitters throughout history. 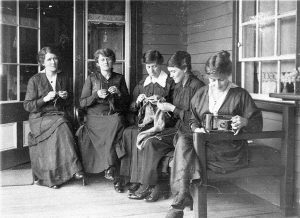 All around the world, women were encouraged to support troops from their hometowns by knitting items for soldiers; items like socks and hats. But besides that there is a history between knitting, espionage and spies. Yes, you read it right. Since knitting was a common craft for women in ancient times, no one would suspect a woman knitting and the craft was exploited by spies and soldiers throughout the wars. 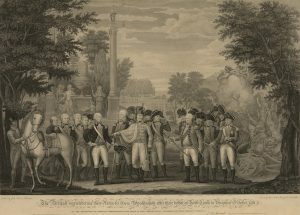 Before the Revolutionary War, all clothing was handmade, so crafts like knitting and sewing were practically important, but these crafts also provided women a way to express themselves and their own political views. Boston Tea Party (was a political protest that occurred on December 16th, 1773. American colonists, dumped 342 chests of British tea into the harbor to protest taxation.) is one of the examples of Americans protesting British taxation. Women in colonies were also avoiding taxation on textiles by making their homemade clothing. One of the most famous among the knitting spies is Molly “Old Mom” Rinker. She was one of George Washington’s spies who sat on a hilltop on a beautiful day and knit, according to An Encyclopedia of American Women at War. Actually, she was spying on the British during the Revolutionary War. When she was knitting, she hid messages in balls of yarns to share the information through these balls with fellow soldiers. We can call her one of the famous amongst American knitters of all time. 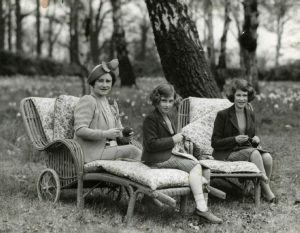 Before the Civil war; knitting was a hobby for wealthy women, like knitting for charity as machine-knit items were getting popular. After the war broke out; soldiers were using machine-knit stockings, but they were seen as sleazy because machine-knit socks would wear out easily. This was causing soldiers to be left barefoot, which would cause blistered and infected feet. Many women began knitting for troops, sending their handmade socks and hats to military camps and hospitals with letters full of encouraging notes. 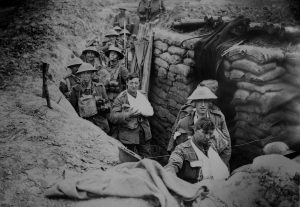 The US entered World War 1 on 1917 and after a year the war was over, when German surrender on 1918. During this time period, the need for knit items was still high. 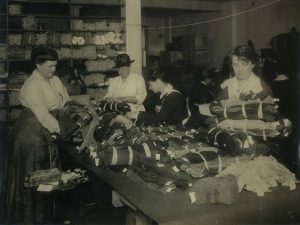 The Red Cross put out calls for millions of knit items, such as wristlets, sweaters, and pairs of socks. Just like Civil War, knit socks were especially important. Personal knitting during this time was frowned upon, as was hoarding yarn. Knitters were expected to return completed items or return the yarn within almost a month, 21 days to be exact. Knitting for troops continued throughout World War 2. Even Queen Elizabeth II (who was not yet the queen) was knitting for troops during this era. Before Pearl Harbor, American knitters were preparing care packages for allies like Britain and France, containing food and knit items. After Pearl Harbor, they turned their attention to American troops. During World War 2, female spies used knitting as a disguise and used the craft to send secret messages to fellow soldiers. Like Morse Code, and ordinary loop creates a dot, and the purl stitch can be used to create the dash, according to the authors of Writing Secret Codes and Sending Messages. The knitting spies even used a form of steganography to drop messages into the knitted material. The Belgian Resistance during World War 2; used the method of dropping a stitch to form a hole, and purling a stitch to form a bump to track the movements of the Germans. And no one suspected the grandmas sitting in-front of their windows knitting peacefully. Knitting and spying often go hand-in-hand that maybe you might want to try to hide messages to your projects; using the Morse Code or even binary coding languages, using knits and purls like zeros and ones. Possibilities are endless. Even though the history of knitting involves dark times like wars, hiding secret messages in your crafting projects might be fun for today. I am a knitter and I found this Article Very interesting and informative . Thank you for the information. Thank you! We are so glad you liked our article.